Nowadays, social media, email and countless other distractions are all competing for our attention. It’s often difficult to focus on one task at a time. Fortunately, there are plenty of apps out there to get focused, organised and make the best of your time. Do you ever find yourself reaching for your phone or browser and clicking on Facebook, Instagram or Twitter for the hundredth time that day? Those clever Social Media creators have deliberately designed their apps to be addictive, and sometimes it’s useful to have a little help breaking that addiction. Focus, is an app for the Mac that I use which can help you cut down on your social media usage. It can also stop you constantly checking your email or your favourite website as much. You can choose which sites you want to block and then start focusing for the default set period of 25 minutes or choose your own duration. Alternatively, you can set a daily schedule for when you block apps, sites and email. For example, you could decide to block them between 9.30 and 12.30 and allow yourself to look at them over lunch. If you do try to access a blocked site, for example, Facebook, you are instead shown a motivational quote to spur you on. Focus also has a built-in Pomodoro Timer. The Pomodoro method is a time management technique where you break your task down into intervals of work, with a mini break. Then you have a longer break after several work sessions are complete. 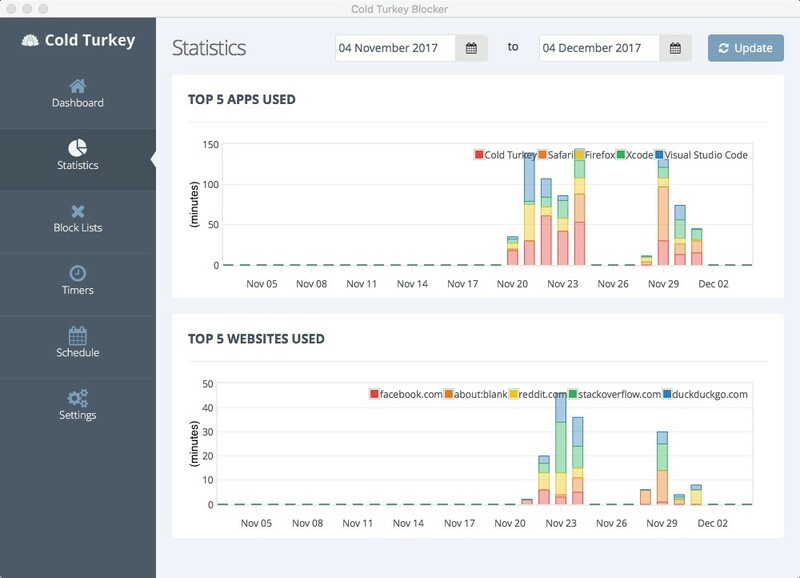 Cold Turkey has very similar features to Focus, with the benefit that it works for PC as well as Mac. One interesting addition is that you can use a lock on the timer to prevent changes. This means it is much harder to override, which can be a good thing if you are easily distracted. Before you decide to block any apps or websites, you can also try using your computer as normal and use the statistics mode to see how much time you are wasting and on which sites. As well as desktop computer distractions, of course, most of us also have phones and tablets. That’s where the App Freedom comes in. Along with versions for PC and Mac, there is also an iOS version. You can use Freedom to block websites, email and apps to restrict your usage. If you need total focus you can also block the internet entirely. There is also a lock mode when your motivation is low and you need to ensure you don’t let your Social Media Habit get in the way of getting your tasks done. 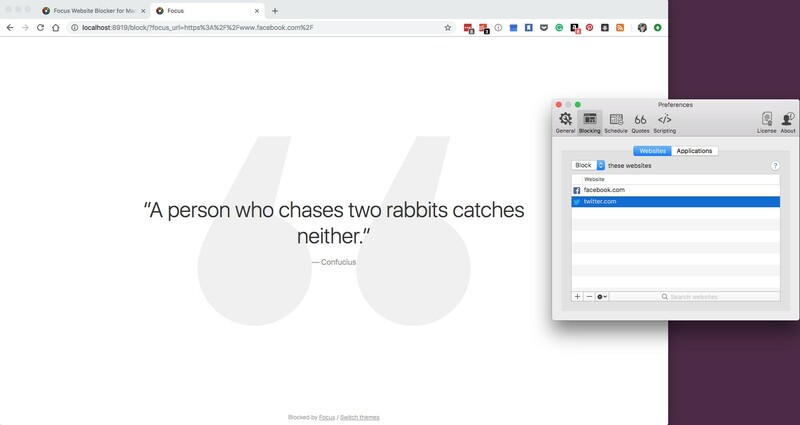 An interesting feature about Freedom is that because it is available on both Mac, PC and iOS you can sync blocking distractions across all of your devices. This means you won’t be tempted to sneak a look at your iPhone while working on your computer. Freedom also lets you schedule blocks in advance and create recurring blocks, so you can set up a distraction free work schedule for your week. If you are an Android user, take a look at the app Anti-Social. Download the App and use it for 2 weeks. The App will monitor how much you use your phone and what you do with it compared to other users in the world. This will give you an indication of what apps you are wasting most time on if any. You can then blacklist certain apps to reduce your usage. Simpler than downloading any app is to put your phone in Do Not Disturb mode which will stop you receiving App notifications and calls when you really need to focus. Better still, turn off notifications for sites like Facebook and Instagram which will help you stop wanting to instantly check and respond to comments and new posts. If you have to write blog content or proposals, having a big fully fledged writing app can be distracting. Often it’s best to just get all the information written down quickly without worrying too much about formatting. Once that first draft is done that’s the real time for formatting and editing. There are plenty of options out there for distraction-free writing. Here are a few you might want to explore. This is an app I use myself, especially if I want to get ideas drafted out quickly. The interface is purposefully very sparse and white. All you do is start typing. There is also the option to put the app in paragraph or sentence mode. For example, if you choose sentence mode, it will fade each previous sentence as you write the next. This helps remove the urge for you to go back and edit it before you have written a full first draft. This helps speeds up writing. If you need to hit a specific word count or character limit you can show that in the top right corner too. For even fewer distractions you can put the app into full-screen mode. You can also optionally play mood music such as raindrops, although personally, I find this a little annoying. When you are ready to format your text you can do this with Markdown or use the format menu at the top of the screen. Text can be saved in various formats including Rich Text, Pdf and HTML, which is very useful for blog post writing. IA Writer is another distraction-free writing tool. It’s very similar to Focused, however, IA Writer is also available for PC, Android and iOS. As with Focused it has a very clean and simple interface and allows you to concentrate on a sentence or paragraph at a time. 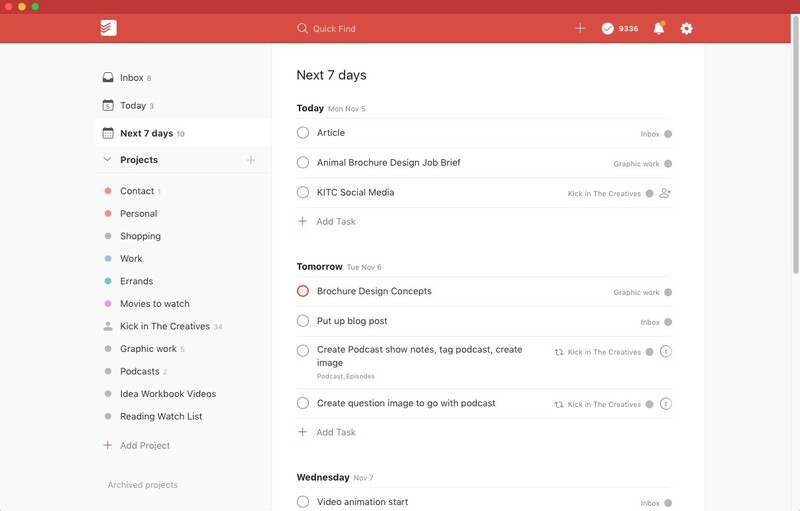 Todoist is currently my go-to app for organising my freelance design work and personal projects. It’s simple enough to use, but also has plenty of features if you need them. The simplest way to get started is to add a project, for example, “My Brochure Design Project.” Then within that project you can create tasks/to-dos. So you might add a task called “take a brief” and another called “initial visuals”. You can schedule each task and even send yourself reminders. If you want to take things even further you can also add a label to your tasks, for example, the client’s name. Todoist will then show you what you need to get done “Today” or over the next 7 days. Once you complete a task, just click in the task circle and it disappears. Some other useful features of the app are the ability to schedule recurring tasks. So for example, if you have to design a regular newsletter for a client you could schedule that for every month. Todoist also lets you allocate tasks to other people that you share a project with. So if you were collaborating with another creative, you could allocate certain tasks to them and the rest to yourself. Another big time saver is that you can convert Outlook or Gmail emails into tasks. Imagine a client emails you with amends, you can simply convert that email to a task in your list. Do you remember an app called Wunderlist? It was an incredibly popular and easy to use To-Do app for organising your work and life. It was bought by Microsoft and a later iteration is now known as Microsoft To-Do. If you’re a Window’s user this might be a good choice for you as it integrates with Outlook tasks. Microsoft To-Do works similarly to most To-do apps. You can create lists, then break these into tasks with deadlines and reminders. You can also repeat tasks plus break them down into smaller sub-tasks which it calls “steps”. Once you have inputted your lists and tasks you can then view them by “My Day” which shows today’s tasks or “Planned” which shows Today, Tomorrow and Next 5 Days as headings. Apps with a very similar style to Microsoft To-Do and Todoist are Things (Mac and iOS) and OmniFocus (Mac and iOS). Before switching to Todoist, I used to use Things. It is beautifully designed, but my bugbear with both these applications is that there are separate licenses for Mac and iOS platforms so they become a little expensive. Trello works in a different manner to the previous apps mentioned. You start by creating a board. The board might represent a particular project. Then within your board, you can create lists and on each list, you have what are called cards. There are lots of different ways you could use your lists. For example, you could have a list for each type of job – within that project such as design, social media and meetings. 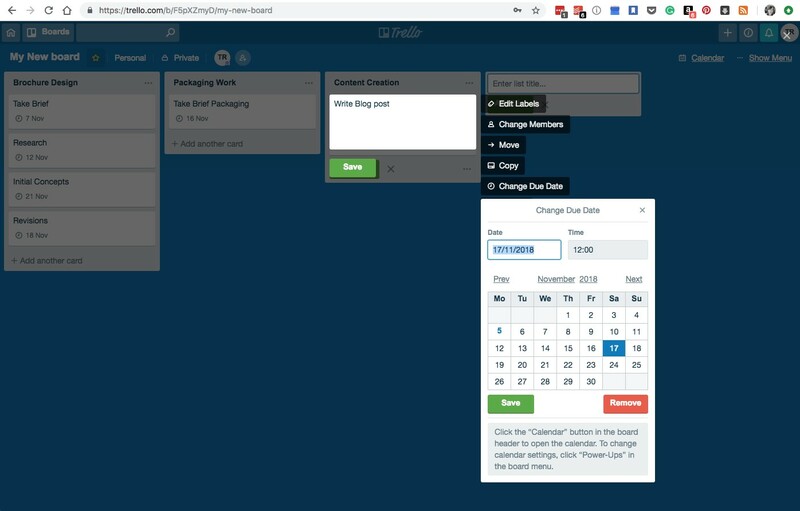 Under those lists, you would create cards to represent tasks where you can add text, images and links and also add a due date. You can also collaborate with other people on Trello which is useful for joint projects. If you already use Google products like Gmail and Google calendar you might want to check out Google simple free to-do app called Tasks which integrates with them both. It lets you create lists and then add tasks with deadlines. You can even add sub-tasks too. Simply planning your day or week can help you be more productive, plus there is an immense sense of satisfaction to ticking things off your To-do list. Also by scheduling other minor tasks you might have to do outside of work, it frees up your headspace to focus on the task in hand.